You should stop participating in this Satanic holiday. 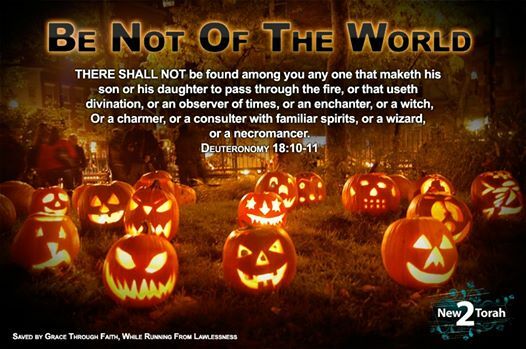 Ten reasons you should not celebrate Halloween. 1. October 31st has long been known as “The Festival of the Dead”. 2. The Celtic tribes and their priests-the Druids-celebrated this day as a marker for the change from life to death. 3. Halloween is still celebrated today by adherents of witchcraft who use the night for their rituals. Witches celebrate Halloween as the “Feast of Samhain”, the first feast of the witchcraft year. 4. Being a festival of the dead, Halloween is a time when witches attempt to communicate with the dead through various forms of divination. Christians should not be involved with occultic practice or divination. Note God's command against divination in Deuteronomy 18. 5. Occultists believe Halloween is a time of transition between life and death. Some occult practitioners practiced divination and believed you could learn the secrets of life and wisdom by lying on a grave and listening to the messages from the long departed. 6. Occultists also taught that spirits and ghosts left the grave during this night and would seek out warmth in their previous homes. Villagers, fearful of the possibility of being visited by the ghosts of past occupants, would dress up in costumes to scare the spirits on their way. They would also leave food and other treats at their door to appease the spirits so they would not destroy their homes or crops, but instead move on down the road. That is the real reason why kids dress up in costumes today and go door-to-door seeking treats. 7. Occultists also would try to scare away the spirits by carving a scary face into a pumpkin. This horrible visage would hopefully move the spirit on to another home or village and spare that home from destruction. Sometimes the villagers would light a candle and place it within the pumpkin and use it as a lantern (hence the name, Jack-o-Lantern). This is the origin of carving pumpkins at Halloween. 8. In some witchcraft covens, the closing ritual includes eating an apple or engaging in fertility rites. In the Bible Genesis 3, eating a piece of fruit brought sin and death into the world. In witchcraft, eating an apple is symbolic of bringing life. The practice of bobbing for apples brings together two pagan traditions: divination and the fertility ritual. 9. Schools are removing any religious significance from Christmas (often called winter break) and Easter (spring break). Isn't it ironic that most public schools still celebrate Halloween even though it has occultic origins? 10. Participating in Halloween gives sanction to a holiday that promotes witches, divination, haunted houses, and other occultic practices.